God had a lot to say to Abram in Chapter 17. He started the conversation with a rebuke. I am Almighty; walk before me faithfully and be blameless. Then I will make my covenant between me and you and will greatly increase your numbers. To Abram fourteen years had elapsed since the last time God spoke to him. As God perceives time a mere twenty minutes after Abram and Sarai produced a son to fulfill God’s plan he rebuked Abram for listening to “the flesh”, Sarai, to accomplish what “the Spirit” of God had promised to do. When God speaks he will bring what he spoke to pass. If we are not faithful to wait for God, we will be the antonym of blameless – impeachable. Some synonyms for impeachable are: reprehensible, dirty, at fault, in the wrong, punishable, sinful, and unholy. God did not need Sarai’s help. Sarai’s plan wronged a servant girl and made both of their lives miserable. 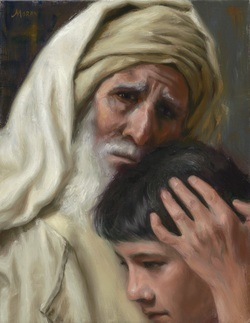 Abram’s compliance and then indifference toward a person suffering under his authority created generations of misery. God loves his people, but he will not close his eyes when they sin in his name. They will be judged. The way we do things is important. If Abram had waited for God to fulfill his promise, we might not have Al Qaeda and ISIS today. God’s way wrongs no one. He has the power and the time to accomplish his purposes without using and abusing people. All scripture quotes are from the NIV Bible unless otherwise noted. This entry was posted in Follow Me and tagged Abram, Al Qaeda, Almighty, blameless, Chronological Bible Genesis 17, covenant, dirty, faithfully, follow me, impeachable, in the wrong, Ishmael, ISIS, promises, punishable, reprehensible, Sarai, sinful, Teena Myers, unholy. Bookmark the permalink.